The Gambian President, His Excellency, Adama Barrow arrived Abuja this afternoon aboard the Nigerian presidential jet as guest of the National Defence College, Abuja. Adama Barrow is expected to be the Guest Speaker at the 26th graduation ceremony of the College. 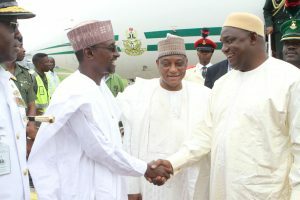 According to his Press officer, Amie, the President would be expected to dwell on the practice of democracy currently taking root across Africa as well as the role of the military in the growth of democracy in Africa. .
Adama Barrow was received on arrival by the Minister of Defence, Brigadier-General Mansur Mohammed Dan Ali (rtd) and Federal Capital Territory Minister, Malam Muhammad Musa Bello. Adama Barrow flight touched down at exactly 1:07pm Nigerian local time at the Presidential Wing, of the Dr, Nnamdi Azikiwe International Airport Abuja, travelling en-route Togo where he had attended the recent ECOWAS meeting. Adama Barrow’s visit would further deepen the friendship and brotherliness between Nigeria and Gambia, as members of the ECOWAS especially as Anglophone West Africa. 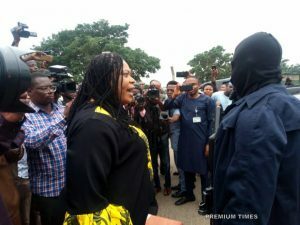 It could be recalled that President Adama Barrow first visited Nigeria as Head of State in January, during which he was conferred with the honorary citizenship of the city of Abuja. Then it was to thank Nigeria’s President for his role in Gambian’s successful transition from the dictatorship of Yahya Jammeh to a truly democratic government. The graduation ceremony which started on Friday, July 27, with a Jum’at will reach its climax with a lecture to be delivered by the visiting head of State. Other programmes slated for the event include an, Interdenominational Christian service as well as a dinner and an award night among others. BELLO LAMENTS CONSPIRACY OF SILENCE OVER THE MISFORTUNES OF STAFF COOPERATIVE SOCIETY…Commits to Staff Welfare.